The basic premise of Sang-Froid is that wolves, werewolves and other diabolical beasts are attacking your isolated cabin out in the Canadian woods, and you have to take control of one of two brothers to repel them with a combination of traps, firearms and a good old-fashioned logging axe. Joseph is a big burly lumberjack adept at both fighting and trapping, while Jack is more of an outdoorsman type with the stamina and general fighting ability of an old lady carrying some heavy shopping; playing as him counts as the game’s Hard mode. Every day starts with a planning phase where you spend action points and money in order to place wolf traps, bonfires, poisoned bait and other such goodies, and then when you’re happy with your setup the game transitions to night-time and you have to go out and hope your traps are good enough to thin the numbers of the pack to the point where you can pick off any survivors in combat. 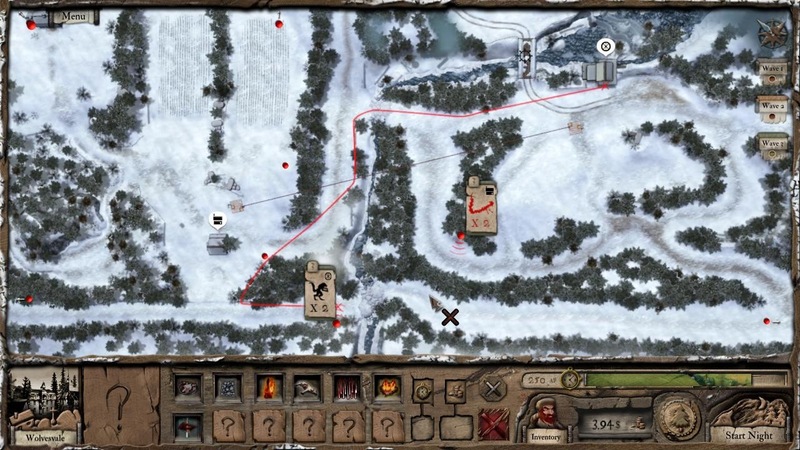 1) Each day of Sang-Froid takes place on the same map, which occasionally expands to cover more territory as you hit certain milestones in the campaign, and this map is far more open than you’d expect from your usual tower defence game. There are stands of trees which serve to funnel the monsters somewhat, but in general Sang-Froid takes the dual problems of mobility and presence to an extreme: you cannot cover the entire map with traps and you can’t be everywhere at once, so you have to place traps very carefully in order to slow the monsters down and give yourself time to respond to an attack. 2) Monsters can appear from just about anywhere. You get to see where they’re coming from in advance and which building they’ll be targeting, and the game will even tell you how their route will change in response to paths you’ve closed with walls of fire, but their spawn points will invariably be split up over the entire map. This exacerbates the mobility and presence challenges mentioned in point 1) as it’s not uncommon for monsters to spawn in very close proximity to the building they’re going to attack, necessitating good trap placement to either kill them or slow them down enough so that you have enough time to get over there. 3) There aren’t many monsters in Sang-Froid. It’s rare that you’ll find yourself fighting more than fifteen in a single night, and those fifteen will be split up into multiple waves; one spawn point will often spawn just a single monster and that’s it. However because those monsters are werewolves they are commensurately tough, and if you haven’t done your homework and given yourself some sort of advantage – a bonfire to increase their Fear Factor and make them back off, blessing your weapons so that the werewolves’ innate resistance to conventional weapons no longer applies, using your gun to shoot a hanging net and drop heavy rocks on them – then it can take a very long time to put down even a single werewolf. Meanwhile other monsters are wrecking all of your buildings, and if you lose a single building you lose the level outright. 4) As previously stated your character is basically one of two degrees of wheezy old man. He can’t run for long without getting tired. He can’t swing his axe more than three or four times without having to catch his breath. A single werewolf can easily tear his head off if you’re not careful, and getting to far away buildings quickly is out of the question unless you’ve set up watchtowers and ziplines in advance. 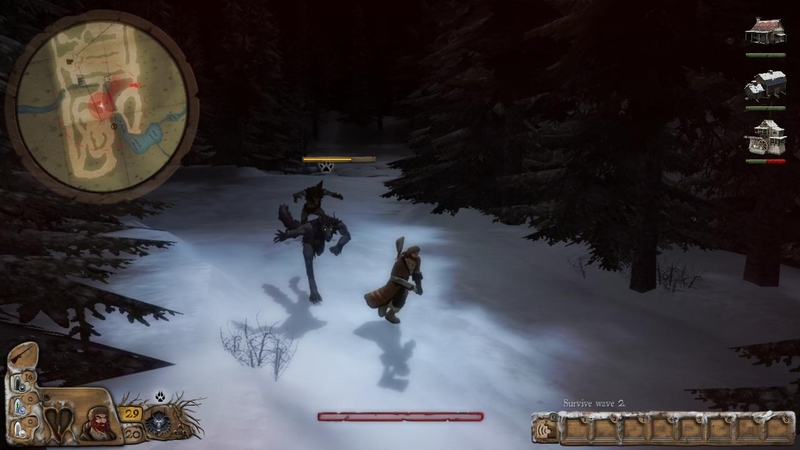 So Sang-Froid isn’t a question of slapping down a ton of traps, chuckling as the idiot monsters run into them and then going to town on the survivors with your mighty werewolf slayer. For one thing you only get a fixed amount of action points to set traps with per day, and that amount isn’t enough to let you place traps at more than three or four chokepoints at once. This means you can’t rely solely on traps to kill the monsters for you — especially since the most efficient ones also have a money cost attached, and money is a very precious resource in Sang-Froid. In the main the traps exist to slow, weaken and maim monsters to the point where you can fight them without being overwhelmed by their numbers or their sheer power, and this will only happen if you put them down in an intelligent way. In fact the planning stages of Sang-Froid remind me very heavily of the first three Rainbow Six games; just as in Rainbow Six the planning stage is where the outcome of the level is actually determined. You can make things run a little bit smoother by whooshing around on ziplines and doing well in combat, but if you haven’t done well in your trap placement you’re going to die, period. 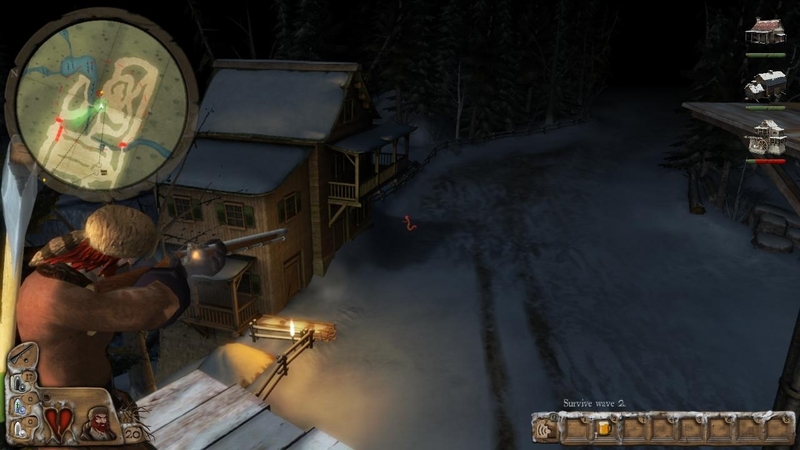 The game’s heavy reliance on pre-placed traps to give you an advantage in fights is emphasised by two incredibly good mechanics that are particularly appropriate for a werewolf game: detection and fear factor. Detection functions much as you’d expect – if the monsters can see you they’ll come for you no matter what, and if you make a noise by shouting or firing your gun any monster nearby will move to that spot as quickly as possible in an attempt to find you – but with the additional complication of your scent being carried towards the monsters on the wind. This can often be awkward if the wind is blowing in an inconvenient direction, but it also allows you to bait monsters onto traps and keep them running after you and not your buildings. Meanwhile fear factor is a numerical indicator of how intimidated the monsters are by your presence. If the fear factor of the monsters (which slowly ticks up over time and which is boosted by the presence of additional monsters) is less than the fear factor of your character they’ll circle you menacingly but they won’t attack. 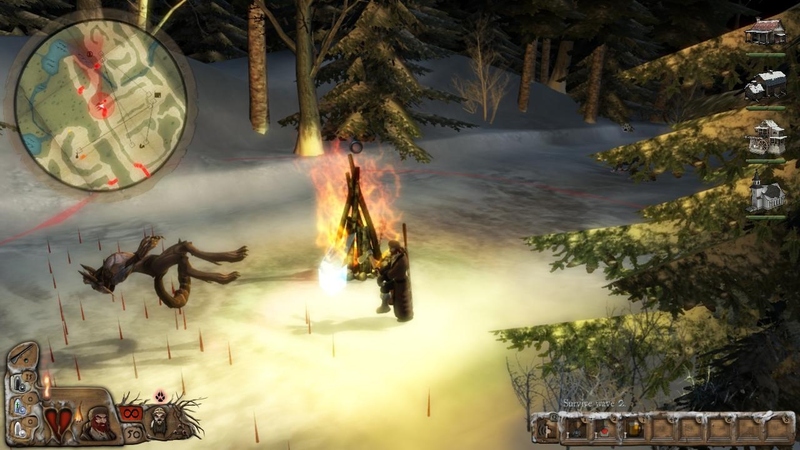 As things initially stand the fear factor of the monsters is automatically higher than yours, but you can temporarily give your fear factor a boost by shouting or by standing next to a lit bonfire. This gets them to back off and gives you some breathing room to recover stamina and reload your gun, and if you’re going to be doing any fighting at all it’s essential to put a bonfire down in the area where you think it’s going to happen in order to give yourself the best odds of surviving it. There are other preparations you can make. Shortly after the game begins you get access to the town of Wolvesvale1 which contains a selection of shops and amenities where you can buy items that give temporary or permanent bonuses to your character. These range from better weapons (and believe me you need them, as the starting weapons are absolutely miserable for anything that isn’t a common-or-garden wolf) to bottles of alcohol that essentially act as powerup items, to wolfskin clothes that give passive damage reduction and speed bonuses. There’s also a convent where you can bless your bullets and your axe so that you can do the full amount of damage to werewolves instead of having to see that “Resistant!” message pop up every time you whack them. All these things (with the exception of alcohol) are incredibly expensive, however, and the traps are already a drain on your meagre supply of cash gained from selling wolfskin pelts. You can get more by spending action points to chop and sell wood instead of putting down traps, which creates an interesting choice between trapping a level properly or skimping a bit in the hope that you can scrape through the level with a bit of extra money; however I never felt like I had enough money to buy everything I needed, which is usually a sign that a game is doing something right. Still, you can spend six dollars and the axe and an additional dollar on the blessing (this is more money than you will ever have at any point during the game) and it still won’t be the last word in melee combat2. 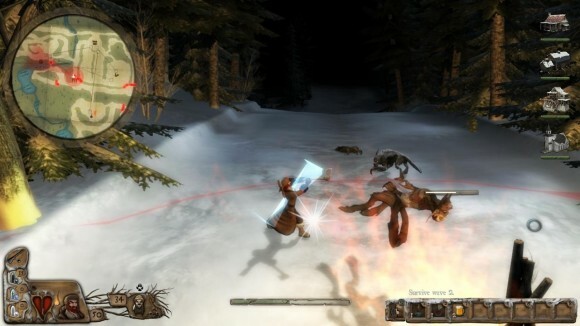 There are seven or eight different types of monster in Sang-Froid, split into two camps: vulnerable to holy weapons, and vulnerable to silver weapons. 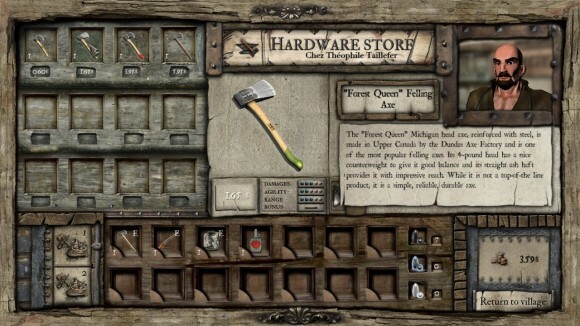 You can’t get silver weapons blessed because they come from an Indian camp and the nuns at the convent are cultural supremacists or something, so missions that feature both monster camps force the player to make yet another tough decision about which type of weapon they’re going to take. Whichever you choose there’s going to be monsters in the level who are resistant to it, and who you’re going to have to rely on the traps to eliminate. Again, it all comes back to the game hinging on decisions you make during the planning stage. I really like Sang-Froid as a game. It’s an excellently-designed piece of tower defence action with several unique mechanics that mesh together very well. I’ve had a lot of fun playing it. Unfortunately – as with all my reviews – I’ve saved all the bad parts of the game for the final two paragraphs, and in Sang-Froid’s case these are literally everything that isn’t the game. When I said it looked like a title from 1999 I wasn’t kidding; it’s locked at some bizarre screen resolution with no option to change it and I haven’t seen a running animation quite as bad as Jack’s since I played Anachronox back in 2001. Still, I wouldn’t hold these low-tech visuals against Sang-Froid except that the developers insist on using them to tell an absolutely godawful story that constantly intruded on and interrupted my attempts to actually play the game. Every time you start a new level the game will show you a cutscene where some characters spout a couple of lines of hackneyed, poorly-constructed dialogue. The voice-acting is abysmal and mostly sounds like the friends and family of the development team, and pressing Escape to quit this cutscene will likely simply start the next cutscene; there have been levels where I’ve had to hammer the escape button three or four times to get back to the planning stage. Then it asks you if you want to watch a tutorial video (these are useful, but I would have appreciated some sort of metric inside the game that tracked whether or not they had been viewed yet and then relegated them to the Tutorials option in the main menu). Then when you’re done with your planning and start the night, you get another cutscene. There are cutscenes in the middle of missions. Cutscenes at the end of missions. Command and Conquer has less cutscenes than Sang-Froid. Metal Gear Solid has less cutscenes than Sang-Froid, for crying out loud; their total lack of quality combined with their sheer abundance actively put me off playing the game. What I don’t understand about this is that it’s actually quite easy to tell an effective story in a game, even with next to no budget for the visuals. Follow Waking Mars’ example: commission a few high-quality character portraits that don’t make the viewer retch at their sheer ugliness and tell the story purely through text3, devoting the time and effort you would have spent doing voice-acting on making sure that text is well-written. The instant one of the participants opens their mouth and delivers a line that sounds like it was recorded by the lead designer’s bored grandpa it’s game over for your story, so why would you open yourself up to the risk? Minimalism is fine in an indie game like this one; more than fine, in fact, as Sang-Froid demonstrates that attempting to ape the high-budget multimedia experiences from bigger developers merely results in a disastrous mess. Sang-Froid illustrates both the strengths and weaknesses of indie developers; they can develop an interesting and unique spin on a concept that you just wouldn’t see from even the more mainstream indies, as they’ve done here, but they also have a tendency to overreach and try to implement game features that they don’t have the resources to execute properly. Or at all. Anyway, I wish I could say it was easy to tune the cutscenes out; unfortunately it’s the exact opposite and counts as a significant black mark in Sang-Froid’s ledger. It’s pretty much the only one, though. Sang-Froid won’t appeal to everyone, I think, but if you like your tower defence a little bit slower-paced and far more thinky than we’re used to the chances are you’ll get along with it very well. Oh, and depending on your musical predilections it also has one of the best soundtracks I’ve heard in the last year, full of folksy colonial-era music that fits both the theme and the game like a glove, and very pleasant icing on a delectable wolf-shaped strategy cake. I wouldn’t play game that had inauthentic werewolves. Nice soundtrack indeed, good share, thanks. Spot on review. Great article, well articulated and accurate.